Summary: Cauliflower steaks are getting quite popular, and we understand why: they're vegan, gluten-free, hearty, easy to make, versatile and absolutely delicious. We decided to try our hand at making cauliflower steaks with our own little twist added: saffron cauliflower puree. Not only was it as delicious as we expected; it exceeded our expectations. Cauliflower steaks are getting quite popular, and we understand why: they’re vegan, gluten-free, hearty, easy to make, versatile and absolutely delicious. 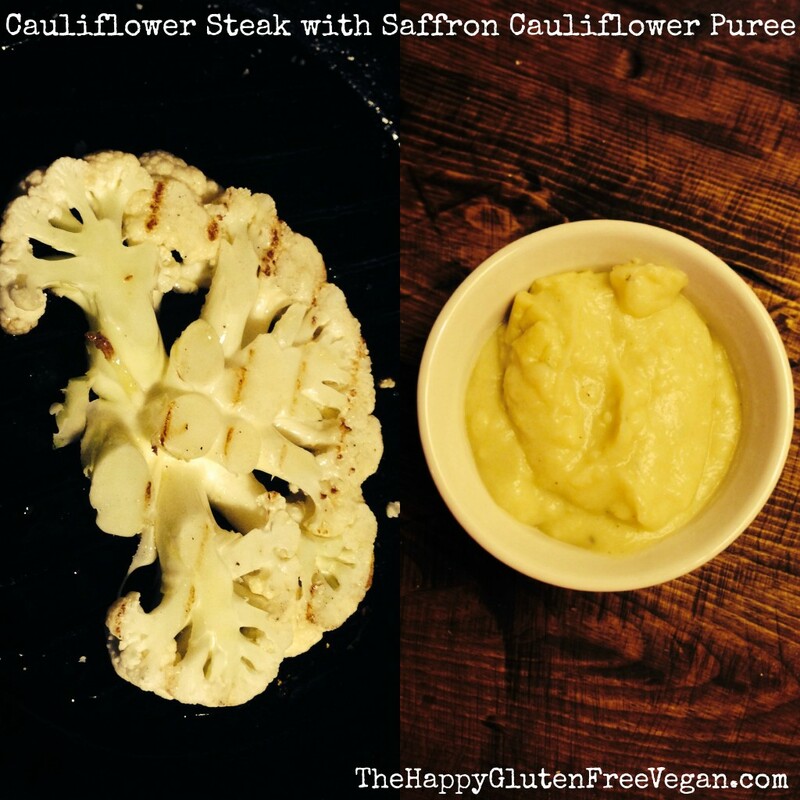 We decided to try our hand at making cauliflower steaks with our own little twist added: saffron cauliflower puree. Not only was it as delicious as we expected; it exceeded our expectations. Cauliflower steaks are simply thick, cross-cuts of a cauliflower head. They are very filling, and the cauliflower takes on the flavor of virtually any seasoning. Remove the stem and any green leaves from the cauliflower. Holding it right-side-up (so with the stem part down), slice the cauliflower in half. Pick up one half and, holding it upright again, slice a nice thick piece off of that half, as if you’re slicing a piece of bread off of a whole loaf. Do the same with the other half. These will be your cauliflower steaks. Take the leftover cauliflower, rough chop it into small bits, and add it to the boiling broth, along with the garlic powder. Set a timer for 8 minutes. Take the remaining 1/2 cup of broth, add the pinch of saffron to it, and swirl it around. The broth will take on a nice, yellow hue. Once you’ve sufficiently swirled it around to turn yellow, set it aside. Get a frying pan, preferably cast iron, nice and hot over medium-high heat. Brush each side of the cauliflower steak with some olive oil. Cook each side for about 3 minutes, adding salt and pepper to each side. Place in the hot oven and set a timer for 10 minutes. Once the cauliflower florets have finished cooking, remove from heat and drain, reserving 1 cup of the broth. In a blender, add the broth with the saffron in it, then 1/4 a cup of the reserved broth from the cauliflower florets, for a total of 3/4 cup of broth. Add the cooked cauliflower florets and blend. You want a nice, thick and creamy consistency. If it’s too thick, add a bit more of the reserved broth. Once it’s at a nice, creamy consistency, pour the puree in your serving dish, and salt and pepper to taste. Once the cauliflower steaks are done baking, serve with the puree either on the side, or poured over the steaks. This pairs perfectly with a crisp green salad, topped with tangy vinaigrette.